Glaciers are effective agents of erosion, especially in situations where the ice is not frozen to its base and can therefore slide over the bedrock or other sediment. The ice itself is not particularly effective at erosion because it is relatively soft (Mohs hardness 1.5 at 0°C); instead, it is the rock fragments embedded in the ice and pushed down onto the underlying surfaces that do most of the erosion. A useful analogy would be to compare the effect of a piece of paper being rubbed against a wooden surface, as opposed to a piece of sandpaper that has embedded angular fragments of garnet. The results of glacial erosion are different in areas with continental glaciation versus alpine glaciation. Continental glaciation tends to produce relatively flat bedrock surfaces, especially where the rock beneath is uniform in strength. In areas where there are differences in the strength of rocks, a glacier obviously tends to erode the softer and weaker rock more effectively than the harder and stronger rock. Much of central and eastern Canada, which was completely covered by the huge Laurentide Ice Sheet at various times during the Pleistocene, has been eroded to a relatively flat surface. In many cases the existing relief is due the presence of glacial deposits — such as drumlins, eskers, and moraines (all discussed below) — rather than to differential erosion (Figure 16.19). 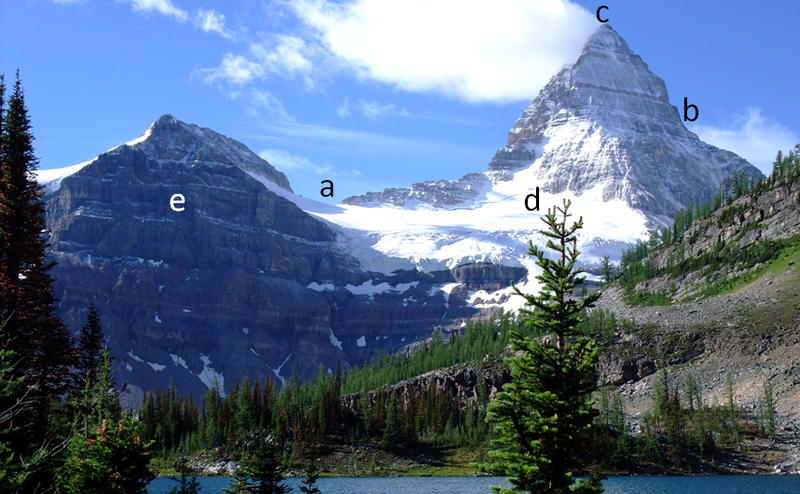 Alpine glaciers produce very different topography than continental glaciers, and much of the topographic variability of western Canada can be attributed to glacial erosion. In general, glaciers are much wider than rivers of similar length, and since they tend to erode more at their bases than their sides, they produce wide valleys with relatively flat bottoms and steep sides — known as U-shaped valleys (Figure 16.20). Howe Sound, north of Vancouver, was occupied by a large glacier that originated in the Squamish, Whistler, and Pemberton areas, and then joined the much larger glacier in the Strait of Georgia. 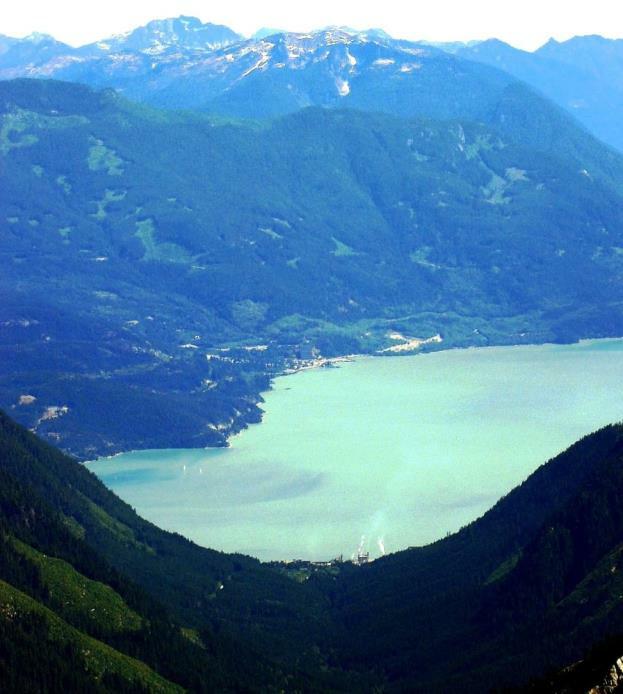 Howe Sound and most of its tributary valleys have pronounced U-shaped profiles (Figure 16.21). U-shaped valleys and their tributaries provide the basis for a wide range of alpine glacial topographic features, examples of which are visible on the International Space Station view of the Swiss Alps shown in Figure 16.22. This area was much more intensely glaciated during the past glacial maximum. At that time, the large U-shaped valley in the lower right was occupied by glacial ice, and all of the other glaciers shown here were longer and much thicker than they are now. But even at the peak of the Pleistocene Glaciation, some of the higher peaks and ridges would have been exposed and not directly affected by glacial erosion. A peak that extends above the surrounding glacier is called a nunatuk. 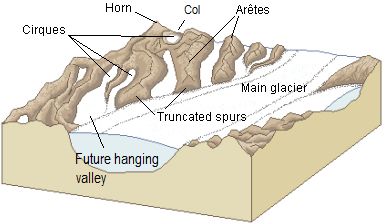 In these areas, and in the areas above the glaciers today, most of the erosion is related to freeze-thaw effects. 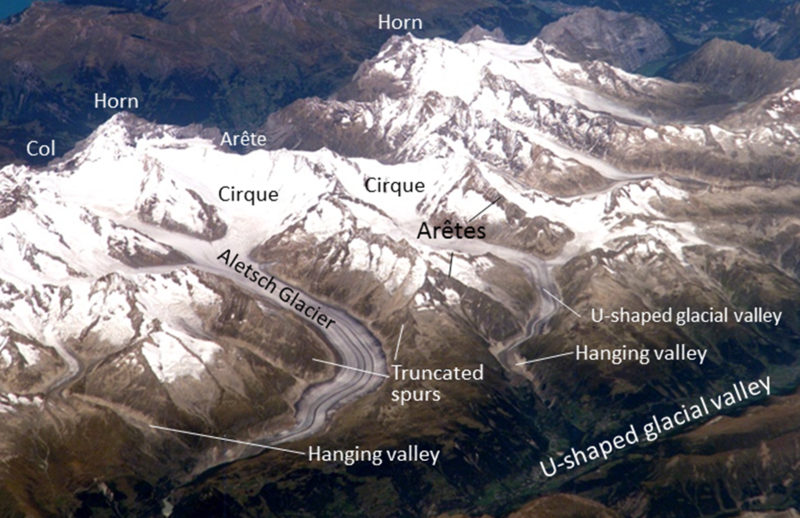 Some of the important features visible in Figure 16.22 are arêtes: sharp ridges between U-shaped glacial valleys; cols: low points along arêtes that constitute passes between glacial valleys; horns: steep peaks that have been glacially and freeze-thaw eroded on three or more sides; cirques: bowl-shaped basins that form at the head of a glacial valley; hanging valleys: U-shaped valleys of tributary glaciers that hang above the main valley because the larger main-valley glacier eroded more deeply into the terrain; and truncated spurs (a.k.a. “spurs”): the ends of arêtes that have been eroded into steep triangle-shaped cliffs by the glacier in the corresponding main valley. Some of these alpine-glaciation erosional features are also shown in Figure 16.23 in diagram form. This is a photo of Mt. Assiniboine in the B.C. Rockies. What are the features at locations a through e? 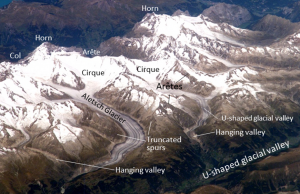 Look for one of each of the following: a horn, an arête, a truncated spur, a cirque, and a col. Try to identify some of the numerous other arêtes in this view, as well as another horn. A number of other glacial erosion features exist at smaller scales. 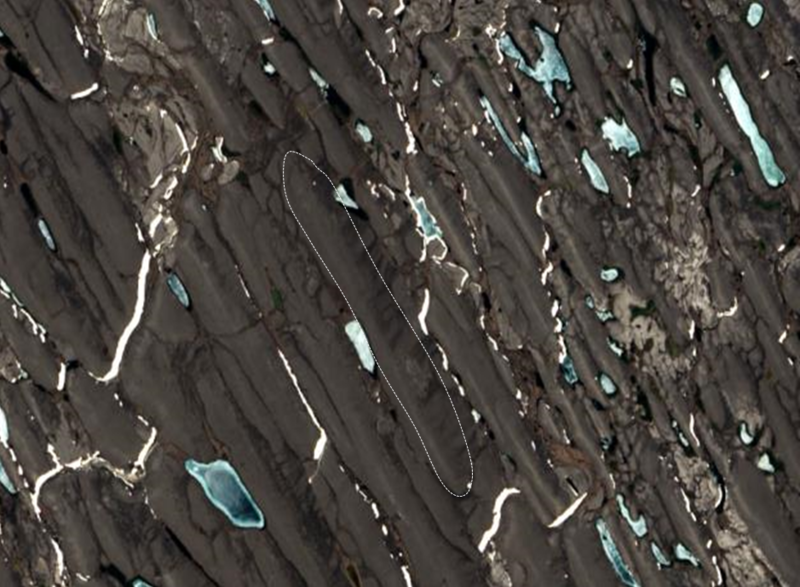 For example, a drumlin is an elongated feature that is streamlined at the down-ice end. The one shown in Figure 16.24 is larger than most, and is made up almost entirely of rock. Drumlins made up of glacial sediments are very common in some areas of continental glaciation (Figure 16.19). A roche moutonée is another type of elongated erosional feature that has a steep and sometimes jagged down-ice end (Figure 16.25, left). On a smaller scale still, glacial grooves (tens of centimetres to metres wide) and glacial striae (millimetres to centimetres wide) are created by fragments of rock embedded in the ice at the base of a glacier (Figure 16.25, left and right). Glacial striae are very common on rock surfaces eroded by both alpine and continental glaciers. Lakes are common features in glacial environments. A lake that is confined to a glacial cirque is known as a tarn (Figure 16.26). Tarns are common in areas of alpine glaciation because the ice that forms a cirque typically carves out a depression in bedrock that then fills with water. In some cases, a series of such basins will form, and the resulting lakes are called rock basin lakes or paternoster lakes. A lake that occupies a glacial valley, but is not confined to a cirque, is known as a finger lake. In some cases, a finger lake is confined by a dam formed by an end moraine, in which case it may be called a moraine lake (Figure 16.27). In areas of continental glaciation, the crust is depressed by the weight of glacial ice that is up to 4,000 m thick. Basins are formed along the edges of continental glaciers (except for those that cover entire continents like Antarctica and Greenland), and these basins fill with glacial meltwater. Many such lakes, some of them huge, existed at various times along the southern edge of the Laurentide Ice Sheet. One example is Glacial Lake Missoula, which formed within Idaho and Montana, just south of the B.C. border with the United States. During the latter part of the last glaciation (30 ka to 15 ka), the ice holding back Lake Missoula retreated enough to allow some of the lake water to start flowing out, which escalated into a massive and rapid outflow (over days to weeks) during which much of the volume of the lake drained along the valley of the Columbia River to the Pacific Ocean. It is estimated that this type of flooding happened at least 25 times over that period, and in many cases, the rate of outflow was equivalent to the discharge of all of Earth’s current rivers combined. The record of these massive floods is preserved in the Channelled Scablands of Idaho, Washington, and Oregon (Figure 16.28). Another type of glacial lake is a kettle lake. These are discussed in section 16.4 in the context of glacial deposits. 16.3 Glacial Erosion by Steven Earle is licensed under a Creative Commons Attribution 4.0 International License, except where otherwise noted.